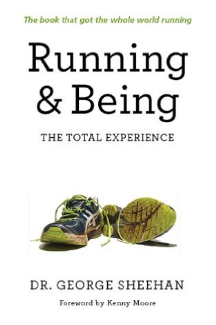 Sakyong Mipham brings meditation and running together in this book. He relates his experiences as a meditation teacher with the stages he went through as a beginner runner, right through to his marathons. He also talks about balancing the sympathetic (running) nervous system with the para-sympathetic nervous system (meditation). Once you get the balance right, great things can happen. Danny Dreyer melds the world of tai chi and running and shows us the way to running efficiently and safely. He does a great job of explaining the importance of posture, core strength and proper alignment. The principle focus of Chi Running is to work smarter, not harder. Understanding the body's elasticity and spring system, you can improve your efficiency by 30%. Written in the 1970's by cardiologist George Sheehan, we get an appreciation for the internal thinking of an elite runner. The ups and downs, depression, elation and everything in between. This book will open your mind to the intricacies of pushing your body to reach its highest potential. In this book, Daniel Lieberman goes into depth to explain how our lifestyles are mismatched to what our DNA has programmed us to do. The consequences are drastic. This book will give you a new appreciation for movement as a powerful medicine. He also explains that are human frames are designed to run. Sitting and inactivity have lead to weakness in our gluteus maximus - a key muscle for efficient walking and running. A great collection of exercises to balance the body and keep muscle imbalances from getting out of hand. Also the author spends a good deal of time explaining the importance of rest and recovery. Following a restorative yoga practice will be invaluable in helping your body to heal and recover from your running training. Now it's your turn! Please let us know your favourite running books in the comments!